Ohhhhh the sweet stuff if you’re like so many Americans today, overindulging in those tasty treats has become far too familiar… but don’t worry, you’re not alone. I totally get it. I am a recovering sugar-addict myself but let’s be real – SUGAR IS TOXIC and it creates a plethora of inflammation, acidity and ultimately, disease within the body. Fact: Did you know that disease cannot survive in an alkaline environment? True story. Although it may taste amazing as it hits your mouth, the consequences are downright terrifying! The scary truth is that sugar is hiding out in just about every piece of processed, packaged, bottled or canned “food” available – some of which you are consuming daily! Let me be clear here – it’s not just the teaspoon (or two) of sugar that you dump into your morning coffee that’s the problem…. It’s the other 20 teaspoons of pure – highly addictive – crap that’s hiding in your daily diet, wreaking massive havoc on your health and causing you to feel sluggish, sick, tired and downright BLEH! Those seemingly healthy “protein bars” and that “healthy salad” you opt for at lunch (eh hem… salad dressing is a nasty culprit to unwanted sugars) are just some of the examples of where the sweet stuff is lurking. I know… it’s totally unfair! 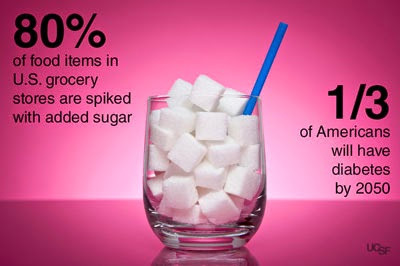 FACT: The average American consumes 152 pounds of sugar per year – which is roughly 22 teaspoons PER DAY! If you are ready to take back your health and drop this insanely common addiction for good, I’ve got some tips to get you started. Always Be Prepared. Stock up on healthy snacks so you don’t feel the 3 o’clock slump in the afternoon leaving you reaching for things you know darn well you shouldn’t be eating. Apples, bananas, dark berries, raw nuts and seeds, chopped veggies… these are all easy WHOLE FOOD options that don’t require refrigeration. If you must have something sweet, 1-2 pitted dates or prunes should do the trick. Eat More Fat. Yep, you read that right. Fat doesn’t make you fat… but sugar does! Quality fats (coconut oil, olive oil, grass-fed butter, ghee, avocado, raw nuts and seeds) help balance blood sugar levels and keep you satiated for longer periods of time. Sleep Like A Baby. If you’re one of the many suffering from lack of sleep or simply not getting enough quality sleep, I can relate. For years I struggled with insomnia and it’s no fun! Not to mention the affects it has on your relationships (sorry, mom!). Try getting on a schedule, heading to bed by 10pm (before your cortisol kicks up again – which keeps you wired and tired!) and wake without an alarm (this takes time to adjust to, start with your days off from work to get in a routine). Aim for 7-9 hours each night. Keep electronics away from your bed and use your bedroom as a place for rest and relaxation (and some lovin’) – no more TV’s, iPad’s etc. Try rubbing lavender oil on the bottoms of your feet and taking magnesium before bed (200-500mg is usually about right – roughly 80% of the population are deficient in this critical mineral unknowingly!). Get Rid Of Stress. Okay, maybe that’s unrealistic. But learning to deal with it in a way that is healthy can do wonders for those sneaky cravings. My personal favorite is EXERCISE – and pilates just happens to be my homebase! Move that body every single day, even if it’s a walk around the block. So many people state that they are too tired to exercise but here’s the kicker – exercise PROVIDES energy! Once you get started, you’ll see what I mean. Do this for yourself. ‘Cause baby, you’re worth it! There are so many things to consider when kicking the sugar habit, but the good news is that it’s completely possible! And there are some really great alternatives to refined sugar too! Try these 5 tips and see how you feel! Change doesn’t happen overnight, remember that. But in time, as you cultivate healthier habits, you’ll see those not-so-healthy habits take a back seat and you’ll be feeling vibrant and energized in no time. You’re sweet enough already, shuggah!